It’s very exciting when you finish your book, but the next step to publish a children’s book is to actually sell it. 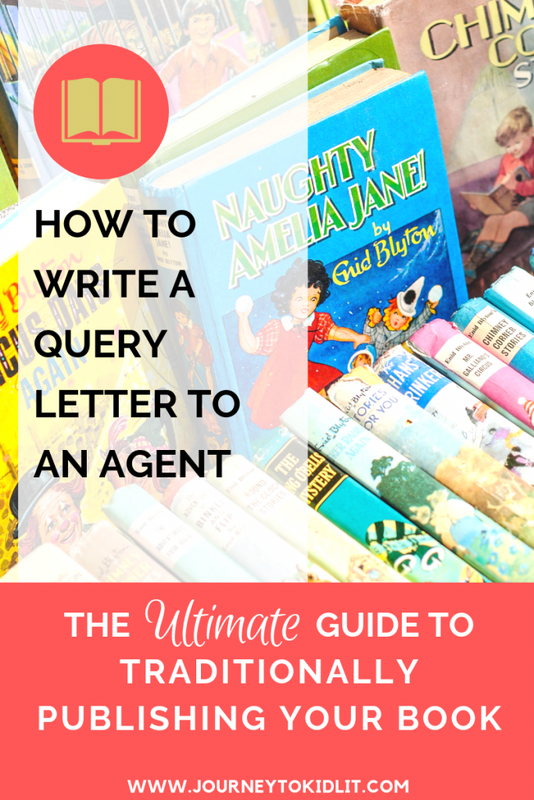 Once you find the perfect agent that you want to send it to, you have to write a query that will make them say yes. A query letter is a proposal for someone to want to publish your manuscript. It’s your first step to intrigue someone in the publishing world that your book needs to be on a shelf. Start with the Proper Formatting when You Write a Query Letter. There’s a specific order that you’re supposed to write a query letter in. It’s the way all professional queries are written and will make you look like you know what you’re doing. Hello, First and Last Name is the greeting I choose to use. This avoids using the wrong pronoun and keeps you from being vague, with a ‘Dear Agent’ greeting–Nobody wants to keep reading something that’s not even addressed to them! This is a great spot to say how you know the agent and why you want them specifically to help you publish a children’s book. Sometimes I get submission offers from conferences, members only mail, or even Twitter, and this is where I tell the agent that. If you haven’t had the privilege of connecting with the agent personally, you shouldn’t skip this step. Research the agent and find something you can relate your story or you about that will create a connection. For instance, they love bagels and so does your MC or they’re from the suburbs and so are you. Even a stretch is better than nothing. I always use Manuscript Wishlist, Literary Rambles, or interviews to find interesting facts to include in my query. What’s one sentence that will intrigue your reader? You want to evoke curiosity and make them think that they want to find our more. The hook and connection can be reversed when you write a query, but most suggest listing your connection first to get the agent to care. 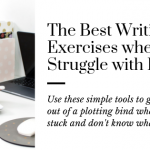 Instead, think of a statement that will introduce the reader to your story–sometimes a strong first line will work here, too! After your hook, you will give a summary to explain your story in more detail. I would avoid introducing any words, places, or characters that the agent won’t have any reference to–Unless you plan on explaining them because they’re the focus of the story. When I had aspects of my world listed, a reviewer told me that those features only confused the reader, since they didn’t have the context of the story. They had me cut those parts out and only focus on the main details to get the agent to read the first pages. 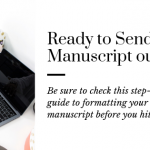 Your goal here is to make the reader hungry for more and turn to your attached manuscript. Use that as your inspiration as you think of how to sell your story! You want to tell them about yourself, but you don’t need to go in depth. This should be limited to 1-2 sentences on why you’re the most qualified to publish a children’s book like this. 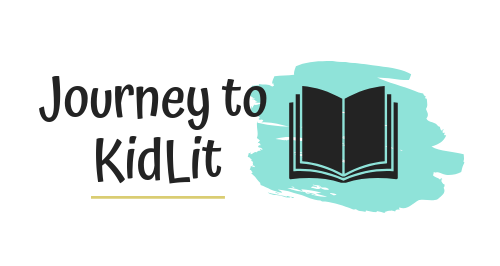 Maybe you’re writing a picture book for schools and you’re a teacher or you’re writing a Middle Grade novel about being a new kid in town, which you were at 13. Try to think of something more than you’re a member or SCBWI. This is conclusion when you write a query. I normally state that the story is either below or attached (Depending on their specifications) and what all they are looking for. For example, below is the first ten pages of NAME OF AWESOME KIDS BOOK. The manuscript is complete and can be submitted at your request. Photos/Graphics–This is not a craft project. Rambling on for too long–Get to the point and stick to it. Querying before the book is ready–If it’s not finished or polished, it’s not ready to send. No exceptions. Know what the agent sells–Check what they’re selling to know if they’d even be interested in your genre. Missing Word Count, Genre, Target Reader, etc.–Even if they’re at the end, they need to be there somewhere. Sounding cocky–Don’t say this is the next best-seller or they’re going to love it. It gives a bad vibe. Lying about yourself–Don’t stretch the truth just to seem credible. It’s better to be yourself, because eventually you’re going to have to be. After you’ve set up a base line for your query, you will want to do research before you finishing writing your query letter. I like to start with the Children’s Writer’s & Illustrator’s Market and highlight all the agents that I can submit my manuscript to. This is a list for all agents that sell children’s books and it gives a little background on each agent, along with their contact info, in the book. Once I know who to submit to, I’ll research more about them to find a connection and decide if they’re really a fit for my manuscript and overall writing career. Get your 2019 copy so you can write a query today! After I start submitting, I create a Google spreadsheet to keep track of my submissions. This way I know who I’m waiting to hear back from in case I get an offer for representation or publication. It also lets me know how long it’s been since I sent a query to know if I need to wait longer. The querying process does take time and most authors don’t get an offer for representation the first time they submit. So be persistent and believe in your story! 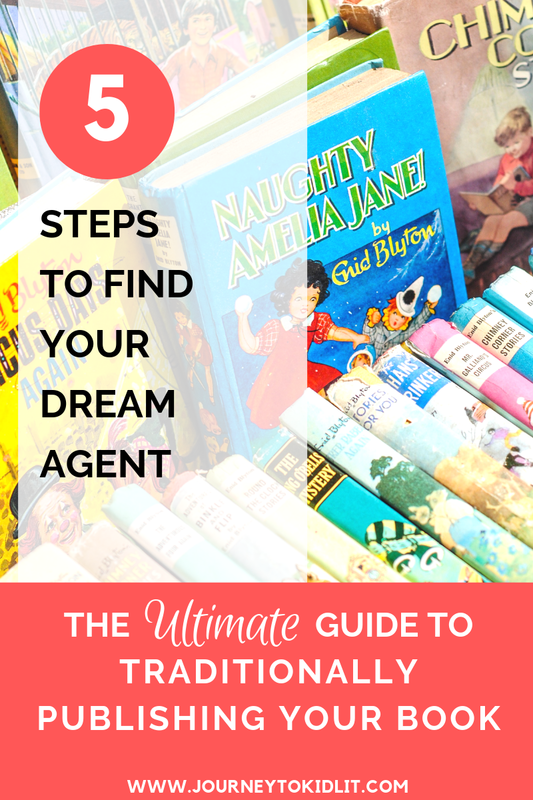 Here is everything I’ve learned to find an agent that will help you land your agent, too! I want an agent so that I can publish a children’s book with one of the big 5 publishers. Which I’m sure is your reason, too! It’s also nice to have someone handle all the paperwork, so I don’t have to. Having an agent is definitely an asset as an author, but it’s not required. Some authors will even sell their first book without an agent and then try to find an agent. A literary agent works as a mediator between you and the publisher. They will help you get the best contract and negotiate for other things, like foreign rights and media rights. For all of this work, they will earn a commission off of your writing advance and sales. To make sure you get a good agent that will find you the best deal, you will need to do your research. Having a bad agent is most of the time worse than not having an agent at all. When do you need an agent? You will definitely need an agent if you want to submit to a closed house, however, there are other avenues for submission you can try before you have to submit to one of them. I’ve been able to submit to some editors at the big house through conferences and memberships through SCBWI & Children’s Book Insider. In the case of a yes though, I’d want to send out emails to some of my top agents with “offer for publication” as the subject line. An offer for either publication or representation is a great way to find an agent you really want because they’re more likely to read your query! It will also keep you from signing a bad contract (Which happened to a friend of mine on her first book). What do you send to an agent? I haven’t needed to write a cover letter since most submissions have gone digital, however, you will ALWAYS need to write a query letter. It’s the way to pitch your book to an agent. A query is essentially a cover letter or introductory email to your story. The email, in most cases, will be quick and to the point. It lays out why the agent should read your book and try to sell your story. The query should consist of six parts: greeting, connection to the agent, hook, summary of your story, a short bio, and a salutation. You want to do this as concisely as possible–300 words or less! Think about what you would find on the back cover of your book and stick to only talking about your book. I know it may feel impossible, but you can do it. I finally got my first full-manuscript request from a publisher and it was so EXCITING! For more in-depth query tips, check out my article on how to write a successful query! **The number one tip to find an agent is to do your research! Agents like queries that are personalized to them, not canned versions. It lets them feel a connection to you or your story. And it helps you, too! Where should you look for an agent? Online Search–I’d hyperlink this, but it’s just Google. I’ve used all three sources and find them all beneficial in their own way. If you are a member of SCBWI, you get a FREE book known as The Book. It has a list of all the publishing houses and agencies, along with contact information for both. This book is updated regularly throughout the year. Although the book is free, the membership is $85 for the year. If you aren’t a member of the Society of Children’s Book Writers & Illustrators, I would recommend joining them. However, if a membership is not in your budget, then you should get the Children’s Writer’s & Illustrator’s Market because it’s just as informative as The Book! This is a very cost-effective resource for you at less than $20! The children’s Writer’s & Illustrator’s Market is a comprehensive list of publishers and agencies with their contact information. Plus it’s updated yearly! I like to get the hard copy and highlight the agencies/publishers that work best for each of my stories. And I try to find an agent that will sell all types of the children’s market since I write for the whole spectrum–or would like to! I recommend investing in at least one of the other sources first, and using the web to research the agent you’re interested in. The best websites for doing your research online are Literary Rambles, Publisher’s Weekly, and Writer’s Market. But you should also use the agent’s own website or the agency’s website, and any interviews you find to help you find an agent that fits your needs. It’s a long process to find an agent, but with the proper research, you will be able to find an agent that will be best for you and your story! Also, get the Children’s Writer’s & Illustrators Market book to start your research. This is the latest version with the most up-to-date information on publishing houses and agencies that you can submit to. Get your copy here! There isn’t a wrong or right choice when you’re picking a publisher. 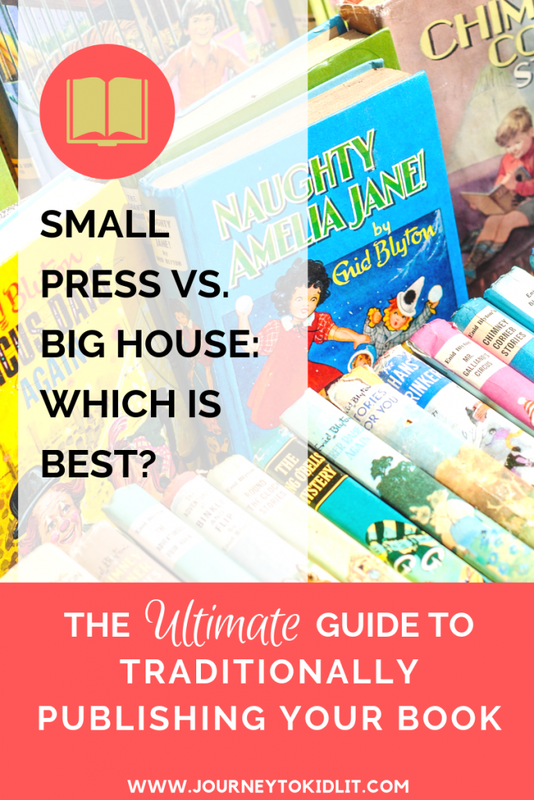 Make sure to weigh the pros and cons to both options before you choose who to publish a children’s book with. Only you know how to choose the publishing house that’s going to work best for your story! Be sure to consider the submission process, author input, marketing dollars, & publication reach into your decision. And know that no matter where you go, it will still be your job to sell your book. 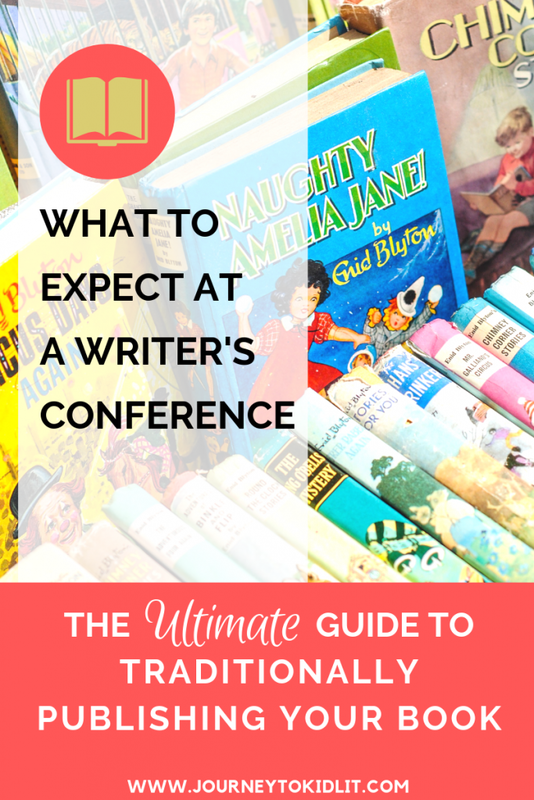 The point of a conference is to network and to LEARN how to write and publish a children’s book! It’s a long process to publish a children’s book, and you may experience rejections before you FINALLY get the yes. But you will get there if you’re persistent and prepared. PS. 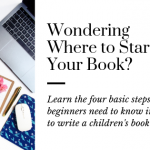 Join my email list to learn more tips on how to write and publish a children’s book so you can rise above the slush pile! 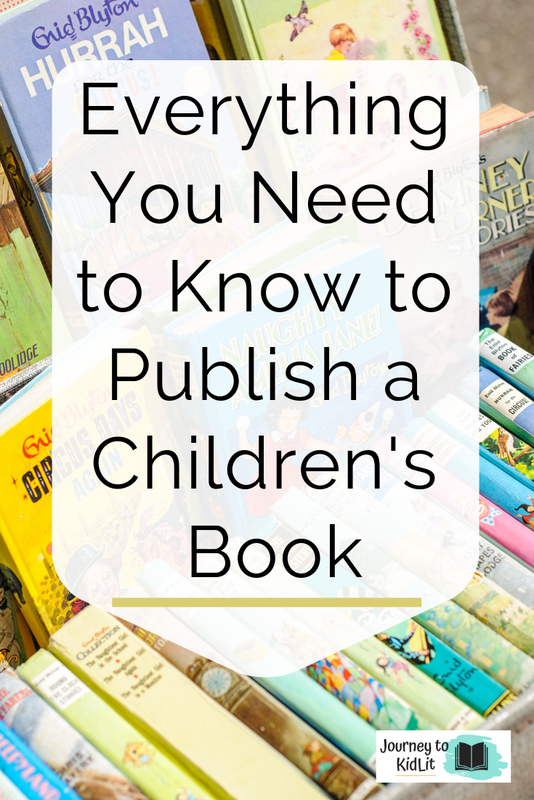 Share These Tips on How to Publish a Children’s Book with Your Writing Friends!